(Read about the 2010 lyric change below). Thus began the Newsweek article in the issue of November 24, 1975. That lead and the news magazine's dry story inspired Gordon Lightfoot to write one of the greatest "story songs" ever. 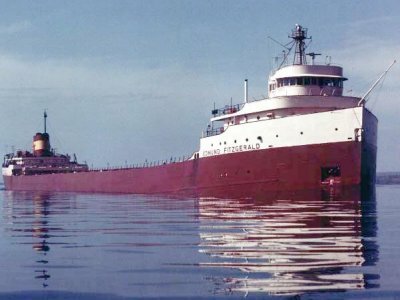 On November 10, 1975, an ore carrier - the Edmund Fitzgerald - sank in Lake Superior during a November storm, taking the lives of all 29 crew members. Later that month, Gordon Lightfoot, inspired by that article in Newsweek Magazine, wrote what is probably his most famous song: Wreck Of The Edmund Fitzgerald. Lightfoot wrote the song as a tribute to the ship, the sea, and the men who lost their lives that night. When asked recently what he thought his most significant contribution to music was, he said it was this song, which he often refers to as "The Wreck". In spite of its unlikely subject matter, the song climbed to #2 on the Billboard pop charts and remains one the most stirring topical ballads ever written, and a highlight of every Lightfoot concert. See the song lyrics below. 2015 marked the 40th anniversary of the shipwreck. Every year, on November 10th and the days leading up to it, there are commemorative services and other programs to remember the ship and the men who lost their lives. You can find information about the 2018 events at the following websites: the Great Lakes Shipwreck Museum (Nov 10), the Dossin Great Lakes Museum (Detroit Historical Society) Nov 10, the Dossin Great Lakes Museum (Detroit Historical Society) Nov 11, the Split Rock Lighthouse Edmund Fitzgerald Memorial Beacon Lighting (Minnesota Historical Society) Nov 10, Lewiston Council of the Arts listed events (Nov 3) and the Great Lakes Historical Society/National Museum of the Great Lakes (Nov 9). 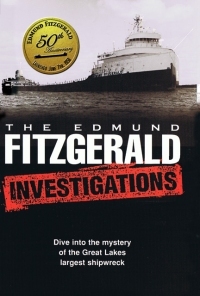 Find out why the Edmund Fitzgerald went down - human error or a 60-foot wave? 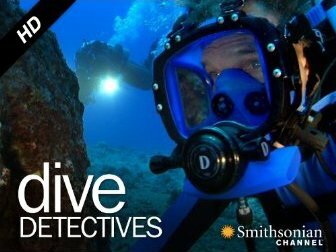 This is the TV documentary originally broadcast by The History Channel, now available for purchase as a download from Amazon Video. Click here or on the image at the left to find out more. In 2010, Lightfoot changed one line in the lyrics of the song as a result of recent findings that it was waves and not crew error that lead to the shipwreck. He always felt bad that the line might have implied that the crew was at fault, and he was very happy that new evidence absolved them. See the lyric change in context below, and read the Toronto Sun news story about it (see below the lyrics). Sayin' "Fellas, it's too rough t'feed ya." ** (Read Toronto Sun story).